Hey! Voss the boss here....err or how Penelo likes to call me Mr. Beauty. I'm here to give you the 411 of a new event (Anything Goes Event). Well least a new event she found out about. Who knows how long it's been going on and she was oblivious to it! Shh just don't tell her K? So I have some pretty dope gacha hoodies to show off. If I didn't show them to you all today she promised to shove.... Well do you know what... I won't say what she said and let you adore that sweet little angel a little longer - gags a bit - Just kidding love that brat to pieces! 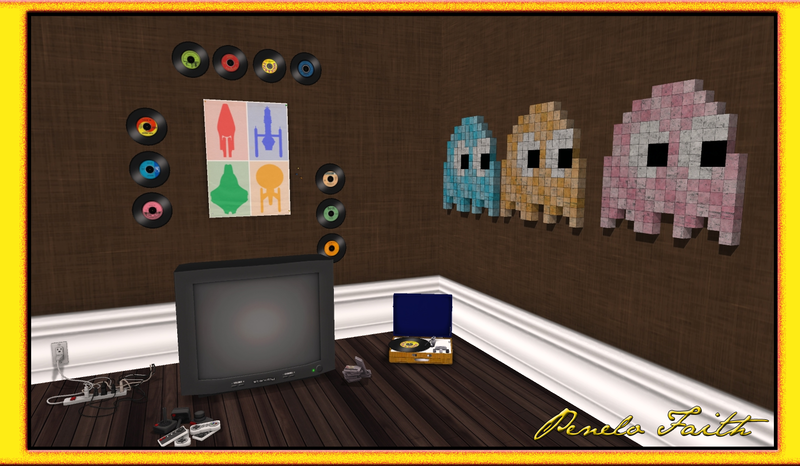 Now because I am suppose to share a song...when I saw all this retro stuff and mainly them ghost from pac man I had a vision! Nah just remembered this game (Namco Museum Vol.3) what a classic! I'll have to admit one of my favorite things about the game below was going into the game room. 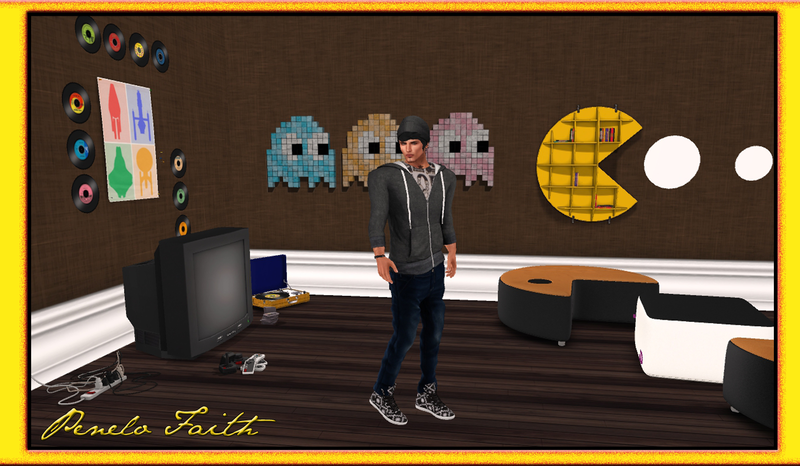 I would walk into Ms. Pac Man's house when Mr. Pac Man wasn't there. We would sing and dance. Even the little dog loved seeing me. How I'll never forget those sinful visits. So I'll share with you the song that made this guy's heart flutter. Don't take me for a sap! I was a young man in love. Just Ms. Pac Man was a bit to old for me but dang was she nice and round -bwahahaha - So enjoy the music and check out the goods below peeps! There is more decor information below as well as more hoodie options. Now the little white dots on the wall were made by Penelo. It's a very simple thing you can do yourself at home. All you have to do is make a cylinder. Than flatten it out. Once it's nice and flat you just make the texture blank. Tada! 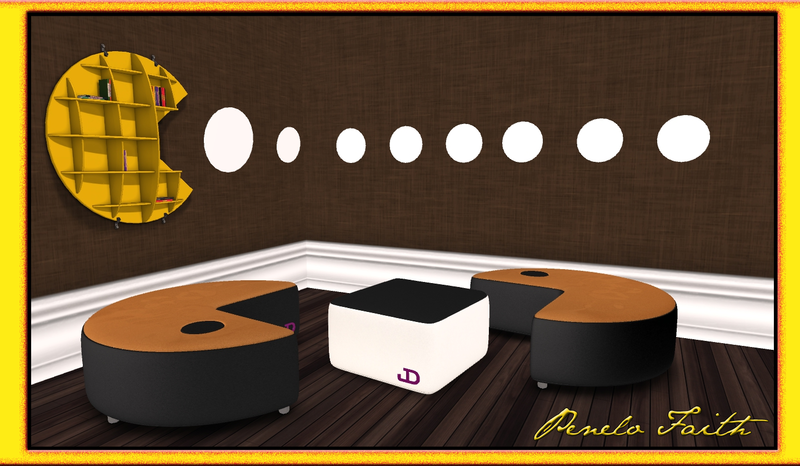 Your very own Pac Man dots for your wall. If you have any questions be sure to email Pen at penelofaith@gmail.com. I am sure she will be more than happy to assist you. Clearly the talented Frogstar did a great job on on the Pixel ghosts. Was funny not to long ago I thought to myself hey I see Pac Man why hasn't anyone made the ghosts. Than BAM she made them for this amazing event called Level UP. Which is for those Nerds and Gamers at heart. The ghosts come in a Grungy and clean version. Some for the ladies some for the men, which will you use? As Penelo would say.... No wait I don't have to do that.. Let's do this the Voss way. Until next time bro's hide your wife your kids and your wallets! Peace out! Labels: 2Real, A's Designs, Anything Goes Event, Cheeky Pea, CP, Frogstar, Home Decor, Just Cool, Mens Fashion, Pekka, Sari-Sari, Second Spaces, Standby Inc.